The speed limit on Academy Boulevard was recently lowered by 5 mph from Pikes Peak Avenue to Milton E. Proby Parkway. 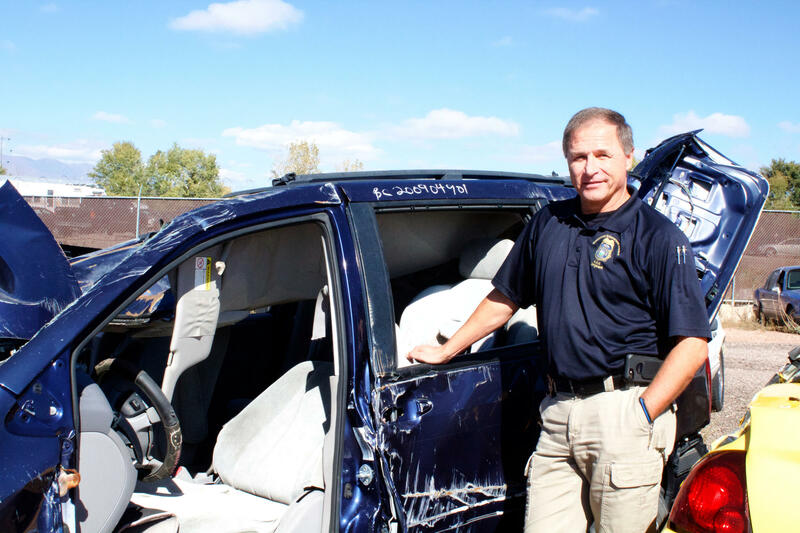 Sergeant Jim Stinson is with the Colorado Springs Police Department's Major Accident Unit. He's as close as you can get to being to a human Google map of fatalities on the city's streets. He calls them his "ghosts." "Between this unit and when I worked homicide, the deaths are the ones that stick with me," Stinson explains. "I don’t remember names but I remember my location and all that…"
Sergeant Jim Stinson is with the CSPD's Motor Accident Unit. He stands next to a vehicle at the department's impound lot. Both passengers in the vehicle survived. The driver of the car that was hit was at fault in the crash and did not survive. Driving south down Academy Boulevard he rattles off details. "I had a motorcyclist that got killed right here," he says, pointing to the middle of the roadway as cars pass by. "That was earlier this year." Stinson says drivers are often impaired, impatient and distracted. "There are distractions everywhere...it's hard for me to know as an investigator if somebody was distracted or not," he says. "My ghosts...between this unit and when I worked homicide, the deaths are the ones that stick with me. I don't remember names, but I remember my location and all that..."
Speeding, though, is different. Stinson says newer-model cars have a black box-type device, just like an airplane. It records seatbelt usage, acceleration, braking, and engine RPM's just before the airbags go off. That gives Stinson and the rest of his unit a lot of information about the crash. In many cases, he says, the box shows high speed. Data from city traffic engineers backs up that claim, finding drivers in Colorado Springs tend to go, on average, 10 mph over the posted limit. Some, even faster. Stinson doesn't think people are good drivers. "We’re competitive drivers," he says. "You don’t see people allowing people to come in in front of them or waving thanks or anything, it just always seems to be a competition...like video games." Unfortunately, he says, in real life there are no reset buttons. "Once you’re dead, you’re dead. It’s over." We continue south on Academy Boulevard, past Austin Bluffs Parkway. He points out two more crash sites where people died—both involved impaired drivers. A block away, there were two fatal motorcycle wrecks within eight hours of each other. On this stretch of Academy alone, we pass 25 of his ghosts. A year-to-year comparison of the number of traffic fatalities in Colorado Springs. 2018 numbers are year-to-date; data from 2016 and 2017 includes the full year. "MAU call outs" refers to the number of times the Major Accident Unit was called out to investigate a crash. To help assist with traffic issues, the Colorado Springs Police Department has installed red light cameras at four major intersections, including two on Academy. A new grant will fund speed enforcement at intersections known for injury collisions, and city engineers will be lowering speed limits by 5 mph on some streets in town this month. The speed limit was already reduced on a portion of Academy Boulevard between Pikes Peak Avenue and Milton E. Proby Parkway. Lieutenant John Koch with the CSPD acknowledges crashes and collisions are always a risk, but says a lot comes down to personal accountability. "By and large, fatal traffic collisions, serious traffic accidents, all of those things are generally avoidable," he explains. "And we can avoid them by watching our own behavior and being cognizant of what we're doing." That includes pedestrians and bicycles obeying traffic laws and being aware of their surroundings. CSPD says of the 12 pedestrians killed to date, 10 were found to be at fault. Two of the four bicyclists killed were at fault, and one of the fatalities is still under investigation. 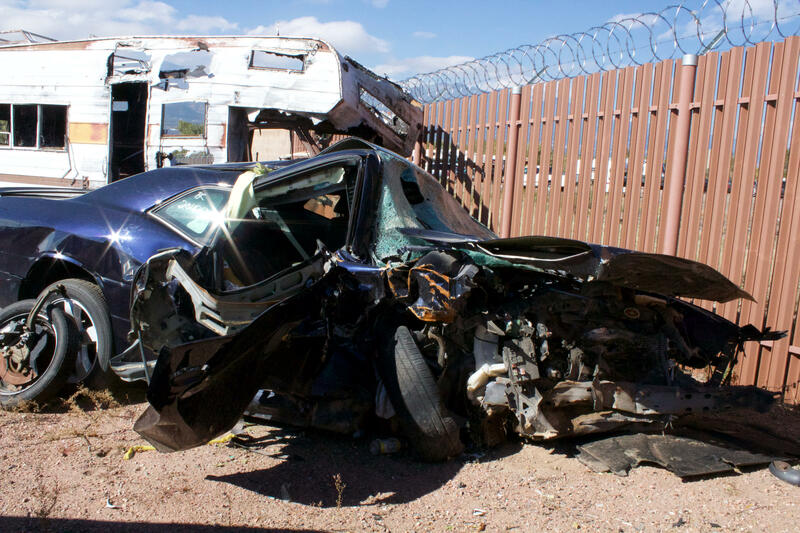 One of the many vehicles involved in a felony crash being held at the Colorado Springs Police Department's impound lot. Sgt. Stinson says the cars are kept indefinitely, until any litigation or prosecution of the person at fault, is complete. The most palpable and haunting part of this issue can be seen at the Colorado Springs Police Department's impound lot. The cars involved in felony crashes like vehicular homicides, assaults and hit and runs languish at the edge of the fenced-in dirt field. Sergeant Stinson calls it "death row." Looking over the crumpled vehicles, he says he wonders what would happen if traffic fatalities were taken as seriously homicides. "[The Major Accident Unit] sees more death than anybody. Traditionally, each year we have more fatalities than homicides...people don’t pay it as much attention. But to me, somebody is still dead." He walks up to a pile of shattered glass and twisted metal. "This is a vehicle that was driven by somebody who enjoyed fast cars. We had information that it could have been a race, but we can’t prove it," he says. Stinson points to another heap of wreckage nearby. "He ran into that pickup truck that's over there." "And a lot of them, they'll try to tell you they weren't speeding, but with my guys and their equations and the black box we can figure out what happened. But, it's just an accident, right?" There are dozens of cars here, some more recognizable than others. The few windshields that remain intact have spider web-like bulges protruding forward—places where Stinson says someone’s head hit the glass. One car has a birthday card on the front seat. It's stained with blood. These vehicles are kept at the impound lot indefinitely, until any litigation or prosecution of the person at fault, is complete. Colorado Springs currently has the second highest number of fatalities for cities in the state, behind Denver with 51. Information included in this report is courtesy of the Colorado Springs Police Department and the Colorado Deparment of Transportation. Data is current as of Nov. 28, 2018. COS Homelessness Action Plan—What Has The City Learned? Colorado Springs has held several public town halls regarding the city’s Homelessness Action Plan for the coming year. The next meeting is Thursday, November 15. Andy Phelps, the city’s Homelessness Prevention and Response Coordinator, put the plan together. 91.5 KRCC’s Abigail Beckman sat down with Phelps to discuss the feedback he’s heard so far.